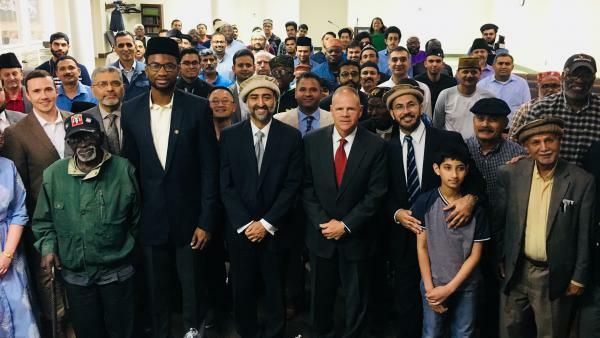 Gen. Robert Neller, front row fourth from left, at Bait-us-Samad (House of the Eternal) mosque outside Baltimore, Md., Thursday night. The Marine Corps' top general was an Iftar guest at the invitation of Marine veteran Mansoor Shams, fifth from left. As the Marines' top general, Neller is a member of the Joint Chiefs of Staff, which advises the president. Last year President Donald Trump skipped Iftar, ending a 20-year tradition of hosting a Ramadan dinner at the White House. In his remarks to the 100 or so Ahmadi Muslims present, Neller gestured to Mansoor Shams, the former Marine who invited him. "He's a Marine and he asked me to come and I said yes," said Neller. This year Trump did host a dinner, last Wednesday night. The guests were mostly foreign dignitaries. No mainstream American Muslim leaders were invited. "And that points to a larger theme that has been developing under this president that Islam is a foreign religion," Omar Noureldin, vice president of the Muslim Public Affairs Council told NPR's Ari Shapiro. "I mean, American Muslims have been a part of this country since its founding." At the Bait-us-Samad (House of the Eternal) mosque near Baltimore, Neller would not take media questions but he did take some from the audience, mostly about how Muslims are perceived by fellow Americans. He explicitly avoided politics or policy with his answers. "There are always going to be [those who] lump large groups of people in single categories. But I think as a Marine I'm more interested in the individual and their ability to serve," he said. "We're all sons of Abraham – why are you fighting me?" Neller recalled telling them. Neller added that in combat, all the distractions of the race and religion of your fellow Marine fall away. Mansoor Shams, the former Marine who invited Neller, says he wrote to the commandant last year, not expecting a response. But Neller did write back and eventually asked Shams to speak to Marine officers about Islam. Neller said that coming to the mosque was a way to return the favor. "It gave me more hope, it gave me more optimism," Shams said. "Even when you're going through those bumps on the road where you're getting bashed left and right for your faith, that when you have the commandant of the Marine Corps standing there like a true patriot, an American, in your mosque it just gives you some goosebumps that say everything is going to be OK."
Shams served four years in the Marine Corps and is now a businessman, but he spends lots of his time doing outreach. Part of that has been organizing Iftar dinners all this month with veterans. Shams says vets are one of the most respected groups in the country right now, and he feels Muslim Americans are one of the most disparaged. As a member of both, he wants to change that. 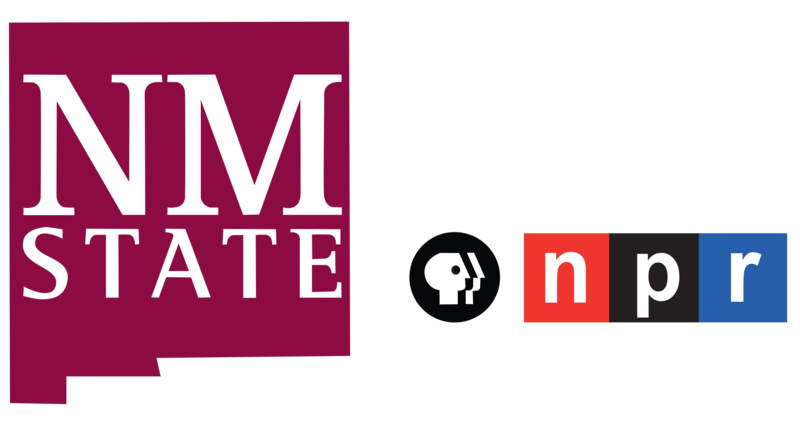 Producer Benjamin Klempay contributed to this story. It's Ramadan, and last year, President Trump skipped the annual White House iftar dinner, ending a 20-year tradition. But there was another prominent U.S. leader at the dinner this week. The top general of the U.S. Marine Corps stopped by a mosque outside of Baltimore, as NPR's Quil Lawrence reports. QUIL LAWRENCE, BYLINE: It's a hard time of year to fast with 15 hours of daylight, so the hundred or more Ahmadi Muslims who turned out at the House of the Eternal mosque were probably thinking mostly about a cold glass of water and dinner. But first, they welcomed their special guest. MANSOOR SHAMS: Sir, you are amongst patriots. I'm deeply honored today to extend my welcome to General Neller. LAWRENCE: Mansoor Shams, the Marine veteran who invited him, introduced Marine Commandant Robert Neller. ROBERT NELLER: You know, I don't consider coming to your mosque to be anything extraordinary, I mean, other than he asked me and he is a Marine and he asked me to come and I said yes. LAWRENCE: Except it was extraordinary since just the night before, President Trump held a Ramadan dinner which included mostly foreign dignitaries. No mainstream American Muslim organizations were invited. At the mosque outside Baltimore, General Neller would not take media questions, but he did take some from the audience, mostly about how Muslims are perceived by fellow Americans. NELLER: There are always going to be somebody who say, you know, they try to put - lump large groups of people in single categories. But I think as a Marine, I mean, I'm more interested in the individual and their ability to serve. LAWRENCE: Shams says he wrote the commandant last year, not expecting a response, but Neller did write back and eventually asked Shams to speak to Marine officers about Islam. Neller told Shams that coming to the mosque was a way to return the favor. SHAMS: It gave me more hope. It gave me more optimism that even when you're going through those bumps on the road, where you're getting bashed left and right for your faith, that when you have the commandant of the Marine Corps standing there like a true patriot, an American, in your mosque, it just gives you some goosebumps that say everything's going to be OK.
LAWRENCE: Shams has been organizing iftar dinners all this month with veterans. He says vets are one of the most respected groups in the country right now, and he feels like Muslim Americans are one of the most disparaged. As a member of both, he wants to change that. Quil Lawrence, NPR News. (SOUNDBITE OF JOEY PECORARO'S "MUSIC FOR HAPPINESS") Transcript provided by NPR, Copyright NPR.